Rhinoplasty, also known as Nose Surgery or Nose Reshaping, is designed to enhance facial harmony by improving the nose's appearance and proportions, bringing it into better balance with the other facial features. Rhinoplasty is also used to correct impaired breathing caused by structural defects of the nose. Rhinoplasty can change the width of the nose at the bridge and nose profiles with visible humps or depressions; correct nasal tips that are enlarged or bulbous, drooping, upturned or hooked; and change the size and position of nostrils that are large, wide or upturned. Nose surgery can also make the nose more symmetrical. The Birmingham, Alabama plastic surgeons at Hedden & Gunn Plastic Surgery have the skills, the experience and the artistic eye to create a more pleasing profile with nose reshaping. For people with functional problems such as a blockage or deviated septum, Dr. William Hedden and Dr. Stephen Gunn perform rhinoplasty to clear the airways and nostrils for improved breathing. Your facial growth is complete. You have a positive outlook and realistic goals for improving your appearance. Some nose surgery patients choose Nasal Implants to clear nasal obstructions, enhance the shape of the nose, correct malformed areas and improve the symmetry of the face. By choosing a member of the American Society of Plastic Surgeons (ASPS) for your nose surgery procedure, you can be assured that you are choosing a highly-trained, board-certified plastic surgeon. ASPS Member Surgeons must meet rigorous standards for training, ethics, physician practice and research in plastic surgery. Your surgical goals with regard to both appearance and breathing. Medical conditions, drug allergies and previous medical treatments. Explain the available options for nose reshaping. Discuss your options for facial rejuvenation and recommend a course of treatment. Discuss the likely outcomes of nose surgery and any risks or potential complications. Be sure to ask questions at your consultation. It is very important to understand all aspects of your nose surgery procedure. It's natural to feel some anxiety, whether preoperative stress or excitement about your anticipated new look. Don't be shy about discussing these feelings with your plastic surgeon. The decision to have nose surgery is extremely personal. You will have to decide if the benefits of rhinoplasty will achieve your goals and if the risks and potential complications are acceptable. Your plastic surgeon and/or staff will explain the associated risks in detail. Poor wound healing or scarring. Change in skin sensation (numbness or pain). Nasal septal perforation (a hole in the nasal septum) is rare. Additional surgical treatment may be necessary to repair the septum, but it may be impossible to correct this complication. These risks and others will be fully discussed prior to your consent. It is important that you address all of your questions directly with your plastic surgeon. You will be asked to sign consent forms to ensure that you fully understand the procedure and any risks or potential complications. Nose surgery may be performed in an accredited office-based surgical facility, licensed ambulatory surgical center or hospital. Be sure to arrange for someone to drive you to and from surgery and stay with you for at least the first night. Anesthesia choices for nose surgery include intravenous sedation and general anesthesia. Your doctor will recommend the best choice for you. Rhinoplasty is performed using either a closed procedure, where incisions are hidden inside the nose, or an open procedure, where an incision is made across the columella (the narrow strip of tissue that separates the nostrils). Through these incisions, the skin that covers the nasal bones and cartilages is gently raised, allowing access to reshape the structure of the nose. 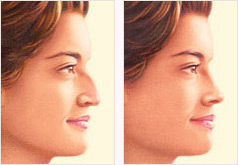 An overly large nose may be reduced in size by removing bone or cartilage. Nose surgery sometimes requires the addition of cartilage grafts, most commonly using cartilage from the septum (the partition in the middle of the nose). Cartilage from the ear or, rarely, a section of rib cartilage is occasionally used. Once the underlying structure of the nose is sculpted to the desired shape, nasal skin and tissue is redraped and the incisions are closed. Additional incisions may be placed in the natural creases of the nostrils to alter their size. A deviated septum is one of the most common causes of breathing impairment. Nose surgery performed to improve an obstructed airway requires careful evaluation of the nasal structure as it relates to airflow and breathing. Correction of a deviated septum is achieved by adjusting the nasal structure to produce better alignment. The septum can be straightened and the projections inside the nose can be reduced to improve breathing. During initial healing, a splint and/or packing will likely be placed inside your nose and a splint or bandages placed on the outside to support and protect the new structures. Initial swelling should subside within a few weeks. It may take up to a year for your new nasal contour to fully emerge. During this time, you may notice gradual changes in the appearance of your nose as it refines to a more permanent outcome. Swelling may come and go, and worsen in the morning, during the first year. The results of rhinoplasty surgery will be long-lasting. As your body ages, it is natural to have some gradual changes to your face, including your nose. However, most of your improvement should be relatively permanent. A healthy lifestyle and life-long sun protection will help extend the results of your new appearance. Everyone's face is asymmetric to some degree. Results may not be completely symmetric, although the goal is to create facial balance and correct proportion. Deviated septum: Misalignment of the cartilage that separates the nostrils, which may cause partial nasal airway obstruction. Rhinoplasty or Nose Surgery at Hedden & Gunn Plastic Surgery enhances facial harmony by improving the appearance and proportions of the nose. To find out more about Nose Reshaping or Rhinoplasty at Hedden & Gunn Plastic Surgery, please contact our plastic surgeons in Birmingham, Alabama today and ask about scheduling your complimentary nose surgery consultation.